I know it is the Indians time to shine right now, and shining they are by the way, but there is something that happened with the Browns this week that impressed me. And after LeBron, I'm pretty jaded about my sports players, so this is a big deal. This ridiculous lockout has been going on and back and forth for entirely too long now. The entire NFL season is on the line here. Not to mention the SuperBowl in Indianapolis. With all the self-centered posturing and greed (I'm looking directly at you Mr. James) that coats sports today like the "You Can't Do That on Television" slime, Josh Cribbs renewed my faith in athletes. 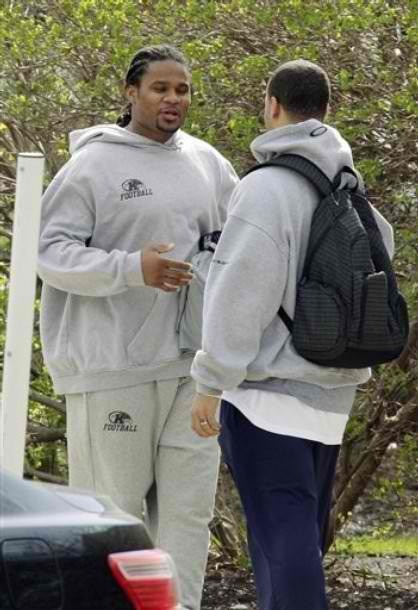 The other day, Cribbs and a few other players showed up to the Browns training facility to work out. They were politely turned away by the security team since everything is in legal limbo until the NFL Lockout is settled. And then a funny thing happened. The guys could have gone home to take a nap, or maybe went out to get some waffles, but they didn't. The guys walked in, looked around and decided that they wanted to get started. The guys went to the Cleveland Metroparks to work out. Previously, they have worked out in Texas with Colt McCoy and are planning on working out at Cribbs' alma mater, Kent State. I have a good feeling about this season. The Browns are showing that they want to win and now, it looks like they are serious. To that I say, WOOF! What can a little rain hurt?